Solo is enjoying our new cottage! 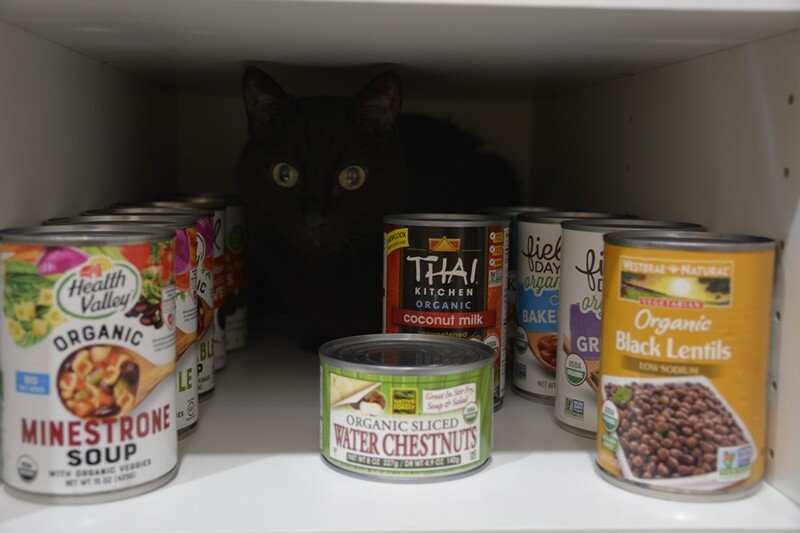 Solo hides in between the canned goods. 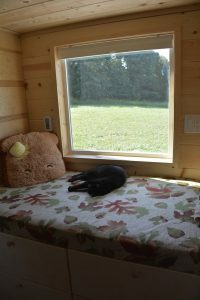 It’s been over two months since we received our brand-new custom tiny house on wheels with off-grid systems like solar power, rainwater harvesting and cistern, and composting toilet. We plan on updating y’all with how our first experiences went, and also the resolution on various fixes including the toilet and plumbing issues. But first we really wanted to feature our kitty, Solo, because it is his home too and some of the design kept his needs in mind. A black blur dashes into the bed loft from our balcony! 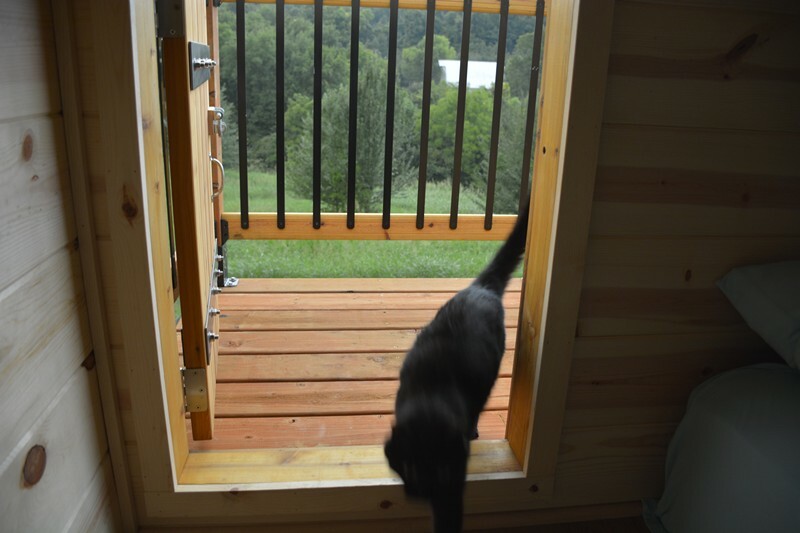 For example, pet-friendly Backcountry Tiny Homes designed and installed a cat litter box hole under the stairs which is big enough for the box and supplies. He really does use this daily! To get in and out, he needs a boost from the cat litter bag stored in the hallway below the hole. 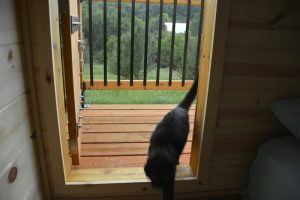 He’s 13 years old but still spry and active – he jumps in and out of the litter box hole, races up and down the stairs, and plays on the balcony connected to our sleeping loft. 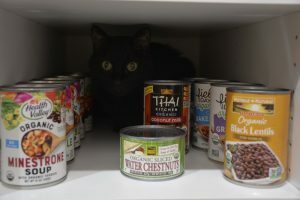 It’s fun to watch his antics and play “hide the treat,” a game in which we toss treats around the house and hide others while he chases thrown ones. He loves to hide in the bottom kitchen cabinets, bed loft shelves, and closet under the stairs. 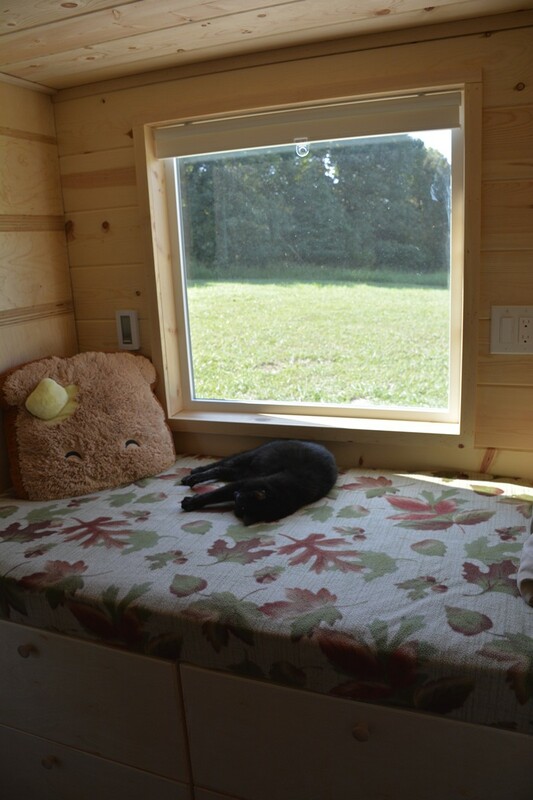 Solo loves sleeping on the custom window seat….so cozy! I’m fairly certain we have more pictures of Solo in our cottage, posing as a stuffed animal and delighting in the balcony. But internet is not easy to access anymore, and our desktop computer where photos are stored doesn’t get internet at all yet. When I find these pics or take more, I’ll post them periodically to our Facebook page so you can enjoy Solo’s journey with us! 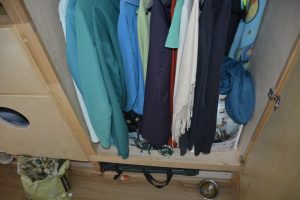 The closet is his new favorite hideout. 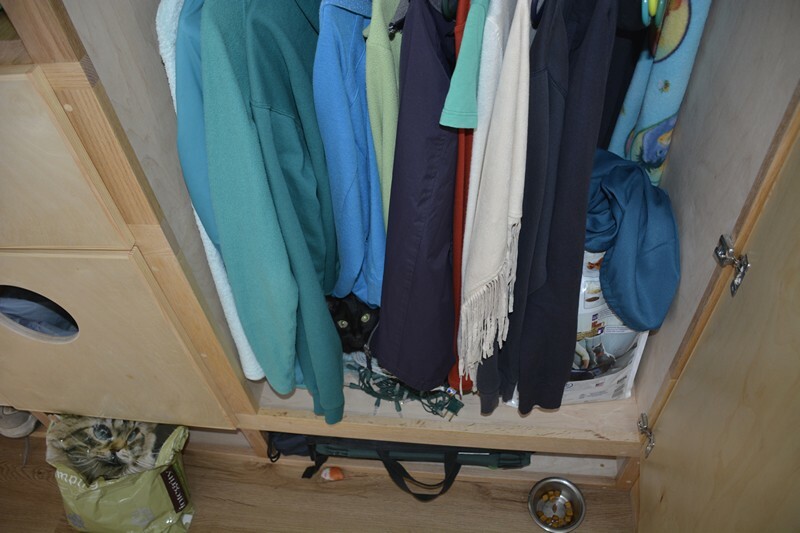 Notice the litter box hole in the cubby at left – yes he really uses it! Our Tiny House Has Arrived!